Good news, everyone! Winter has finally arrived here in Montana, although perhaps a bit more aggressively than most people care for. The temps have been below zero (or just barely above it) for several days now. Personally, I love a good cold snap. It was -2 F when I went on a short run this afternoon which really makes you appreciate quality winter running gear. And also fireplaces. And hot showers. But I digress. Hopefully you all had a lovely Thanksgiving. My parents were able to visit me for the long weekend which was wonderful. My mom and I made cinnamon rolls and I am planning to give them a try on my own; watch for the recipe next month. However, amidst the plethora of sugary holiday treats, we still need dinner. 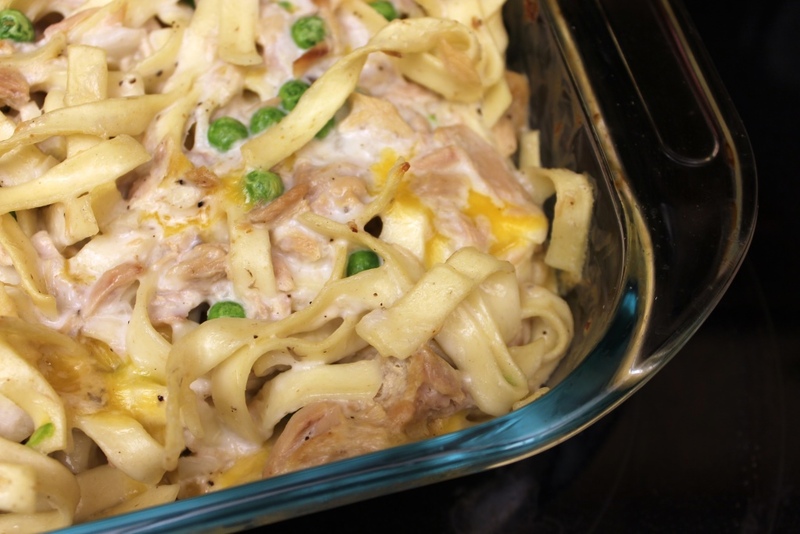 This super easy and filling casserole is quick to throw together while you’re in between batches of cookies and candies and will give your taste buds a nice break from all the taste-testing and eating of broken cookies. A creamy sauce, thick egg noodles and delicious tuna come together for a filling but simple meal. 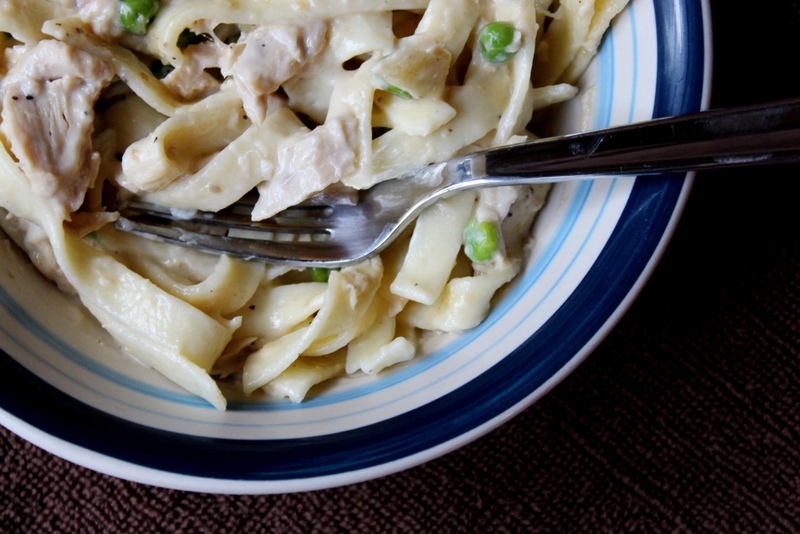 Leftovers reheat nicely; I often eat this for lunch and dinner several days following. If you have a small family and don’t want leftovers, you can cut the recipe in half and use an 8×8 baking dish instead. Cut everything in two except the cream soup so you’re not stuck with half a can of soup lying around. Personal notes: I don’t actually measure the noodles in ounces because I buy the giant Costco bags and I don’t have a cooking scale. Instead, before spraying my baking dish, I fill the pan about halfway with noodles, and cook that amount. Comes out perfect every time. Also, I don’t usually add the cracker crumb topping, but if you like a bit of crunch to your casserole then go for it. I like Saltines because they add good flavor without competing with the rest of the casserole, but use whatever kind you like. If you need a break from sweets, put this casserole in the oven and enjoy a cozy dinner. If you’re still all about the sugar rush, check back in two weeks for the candy recipe my family makes every year. I will be out of the country for a few weeks starting this Friday, but I have one of my favorite recipes scheduled for you while I’m gone. Enjoy! Preheat oven to 350 degrees Fahrenheit and spray a 9″x13″ baking dish with cooking spray. Cook pasta according to directions, drain, and set aside. In a large bowl, stir together soup, milk, sour cream, mayo, 1 cup cheese, onion, salt, pepper and lemon juice until well combined. 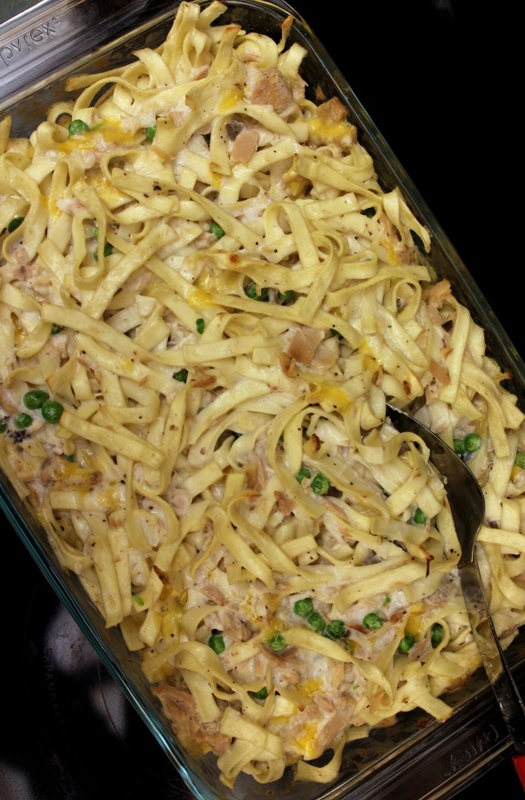 Gently fold in the noodles, tuna, and peas and pour into prepared baking dish. Top with additional grated cheese and/or cracker crumbs, if desired. Bake 30-40 minutes, until sauce is bubbly and top noodles are beginning to crisp. Serve hot. 1 As previously mentioned, I just fill my pan halfway with noodles instead of using a scale. 15 oz is somewhat of a guess. 2 I usually use cream of mushroom.